If you happen to live nearby a Harbor Freight Tools store, consider yourself lucky. 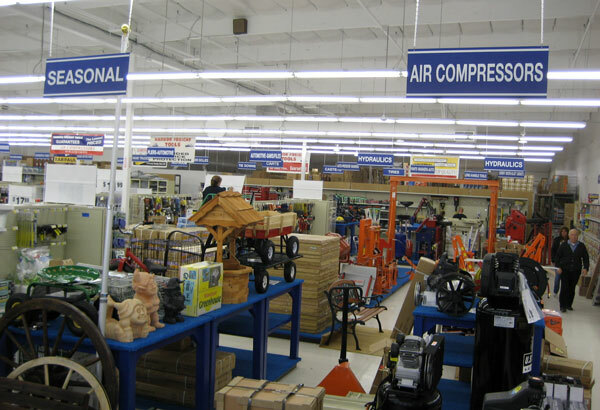 Obviously, this site is about Central Pneumatic air compressors which are sold in their stores. They may not be the best, but they are a great value and arguably the best bang for your buck. The same can be said about a lot of other products found in their stores. Here’s my personal list of the 12 best tools and products you can purchase at Harbor Freight. As if their prices already weren’t the lowest, you can find 20% off (one item) coupons almost anywhere. Either online or in a variety of print publications. This is how I (and a lot of others) first discovered Harbor Freight. Currently, over 30 different models of Central Pneumatic compressors are offered there. No matter what style, tank capacity, or CFM output you’re looking for, you know you’re getting a good value considering price. As long as you don’t expect Mercedes quality, you’ll be satisfied. There is a common misconception that you shouldn’t trust Harbor Freight tools when it comes to safety. Well with hydraulic floor jacks, it doesn’t matter if you spend $100 on a HF jack or $800 on one made by a US brand. Do not trust a floor jack while under the car… USE JACK STANDS! Harbor Freight jacks are very similar in quality to some of the other imported brands at a fraction of the cost. These are essential for working under a car. Don’t be tempted by shiny, bright colored jack stands costing 3x as much. Most are all made the same way and accomplish the same thing just as well. There’s nothing really fancy about tarp but we all use it whether it be for putting under a tent for camping, covering a wood pile, or putting over a dog run. Save some money over Home Depot or Lowes and get a few different sizes of tarp at HF. These are widely considered one of the best bargains at Harbor Freight. Quality is good enough for most uses and you can outfit your tool chest with a full set of metric and SAE socks (deep and shallow) for under $100. Go ahead and do a quick check at Sears to see how much you’d spend there. Speaking of outfitting your tool chest, did you know that HF has some of the best quality tool chests around? Most people I’ve talked to prefer them over the all too popular Craftsman line. Garage Tool Advisor recently listed the popular US General 44″ chest as their #2 pick for best tool chest. Most Harbor Freight chests actually use thicker metal, better drawers, and offer more storage capacity all at a much lower price. Add a 20% off coupon and you’re talking a sweet deal. Why spend $20+ on a multimeter when you can have the same thing for $6? Every garage needs this all-purpose tool and they’re all pretty much the same (sans price). Did you know that a $5 fiberglass hammer from HF tools will last you just as long as the $15 model at a big box store? Their $10 mallets get the job done just as well. While I don’t have much of a use for this, others swear by it. For around $200 you can get a good quality press that gets rave reviews. One of their most popular items. Those who use these know just how quickly you can go through them. While they may not last the longest, the savings still really add up (especially on bigger jobs) if buying the multi-packs. Accuracy is the main reason for purchasing a digital caliper. When the $16 HF version has the same level of accuracy range as a $100+ high-end model, why spend the money? Another great value. Another must-have tool if you do any type of work on cars/trucks. Car Craft Magazine recently recommended HF’s 1/2″ drive click torque wrench praising it for its “Impressive accuracy, amazing value.” Enough said. I could have made this list a lot longer since I purchased many other products there that are still in my garage. A big tip… If you need a tool you may only use once or twice and can’t borrow, check out Harbor Freight. Where do I find replacement parts for this? Jon – You’ll want to contact Harbor Freight Customer Service at 1-800-444–3353. They can help you out.